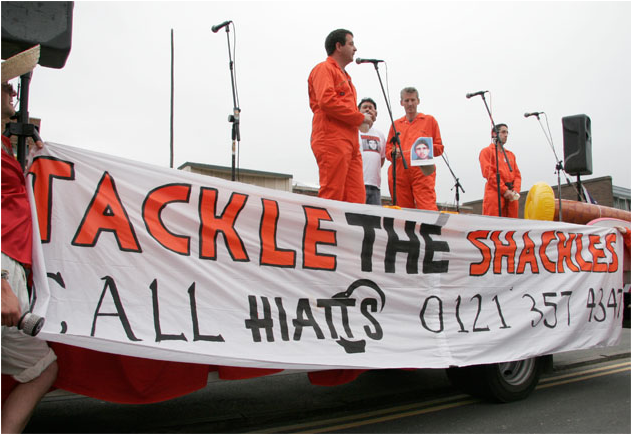 When Dr David Nicholl took on Birmingham firm Hiatts over evidence that they produced the shackles at Guantanamo he had a lot to be worried about. He coordinated an action with music, hippies, lawyers, a stand-up comedian, a large truck and a lot of orange. He was nervous about what his patients would think, worried that he might get an ASBO, felt the pressure of maintaining Amnesty’s reputation, concerned about what his wife might say and anxious about how it might be viewed in light of July 7th terrorist attacks. However, David knew what he was doing was standing up for truth, justice and human rights. He stuck to his guns and the action got great coverage. His courage sets a great example that other campaigners could learn from. This entry was posted in Uncategorized and tagged Campaign Trick, Guantanamo Bay, Have Courage, Hiatts. Bookmark the permalink.